Whether you’re single or you have a family to feed, here’s another healthy option for putting some delicious food on the table… fast! When you look at the photo, it seems impossible that it would only take 5 minutes, but here’s the secret: it’s all about stocking your fridge on the weekend when you have more time. 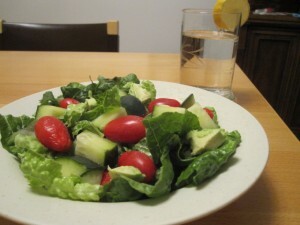 Aside from the lettuce, tomato and cucumber basics, make sure to have extras in the house that will create an interesting salad. Keep a pantry filled with items like olives, sunflower seeds, avocado, dried cranberries, walnuts, croutons and anything that transforms a regular boring salad into something that you’re really excited about eating. It all starts with a good homemade soup broth. Veggie broth is easy to make on the weekends and keep in the fridge. 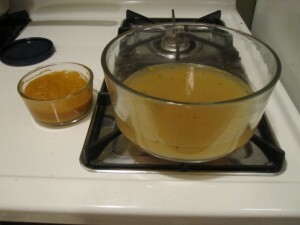 Fresh broth lasts about a week and can be eaten as an actual soup or used as a base for cooking grains. Strain the vegetables after cooking. Keep some of the sliced vegetables to eat in the soup and puree some in the blender to add back into the soup later. 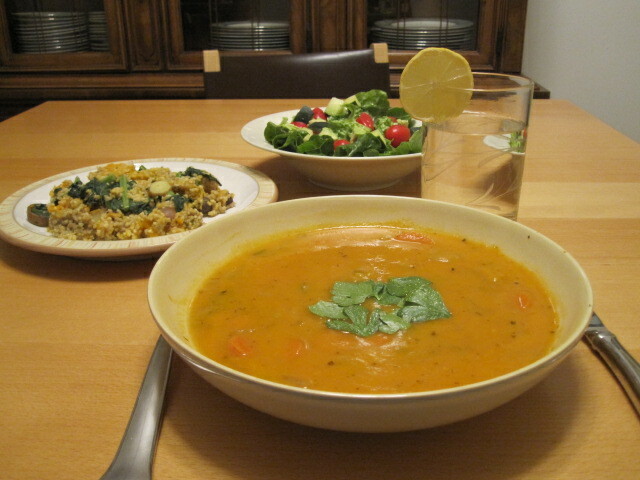 The pureed vegetables have the same effect as the nut cream in the roasted squash soup. The pureed vegetables will make your soup rich and creamy without adding dairy, which reduces the calories and cholesterol… without reducing the taste! If you keep the pureed vegetables in a separate container, you can add them to the soup or to another homemade sauce on demand. The trick is to make a bit extra when you’re cooking a main course. Then you will always have some yummies in the fridge to make a 5-minute meal! 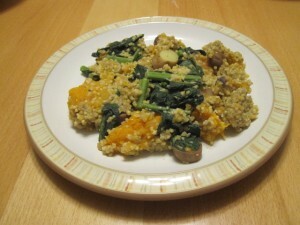 The Millet Delight was from an original dinner of millet cooked in homemade veggie broth, oven roasted butternut squash, kale leaves moistened with fresh lime juice, all of this sautéed with a bit of garlic and olive oil and finished with hemp seeds and some wheat-free tamari. You could heat this in a skillet while the soup is heating in the microwave. See, when you break it down, it’s a cinch to pull off that meal in 5-minutes. It just takes a bit of planning when you’re shopping and cooking on the weekends. Do you have a favorite 5-minute meal? I’d love to hear about it! Thanks for sharing, Carol! That sounds totally delish. I can’t wait to try it… I LOVE broccoli rabe as well. YUMMY! I love this quickie meal. NO MEASURMENT NEEDED, add as much or less than you like, whatever you love the most. I’m a garlic lover, so I add lots of garlic. Put a pot of water on for your favorite whole grain pasta. Steam broccoli florets (or broccoli rabe) until crisp tender, bright green. In large frying pan very low heat put in olive oil, a few hot pepper flakes, and lots of mashed garlic to suit you. (You want to flavor the oil with the garlic and pepper flakes) I keep stirring and using my spoon to mash the garlic in the oil to release the flavors while the broccoli is steaming. I prefer broccoli rabe, but I can’t always get it in the grocery store. After you have heated the olive oil in a pan with the flakes and garlic, toss the broccoli and cooked pasta coating it all with the garlic and olive oil. I love it!! Less than 10 minutes, or as long as the pasta takes to boil.